A Walk on the Wild Side: Turtle Back Zoo ~ The History Girl! I have hated zoos for years. The thought of exotic and wild animals taken out of their natural environs and self-constructed habitats and placed in cages always made me sad. I was taken to zoos as a youngster and as an adult visited some of the better known menageries around. No matter: I still felt for the confined animals. Confining animals for entertainment of the elite has been going on for thousands of years, beginning, it is believed, with the Egyptians in Hierankonpolis in about 3500 B.C. The earliest zoo still in existence was ordered to be built in 1752 by the Holy Roman Emperor Francis I for his wife. It, like others of previous times, were for the exclusive viewing of the royal family; this zoo was then opened to the public in 1765. But animals lived restrictively in cages. It was not until early in the twentieth century that a change in the manner of showing animals and educating the public in the ways of the wild was introduced. Zoos became more open and people-friendly. Might we add, animal-friendly? Animals were permitted to roam much more freely than they had been. In 1907 the Tierpark in Hamburg, Germany, was founded. A radical difference was noted in this enterprise with its open areas surrounded by moats, designed to replicate the animals’ natural surroundings. The famed San Diego Zoo, which opened in 1921, was a pioneer in “cageless” exhibits. Others soon followed the example. 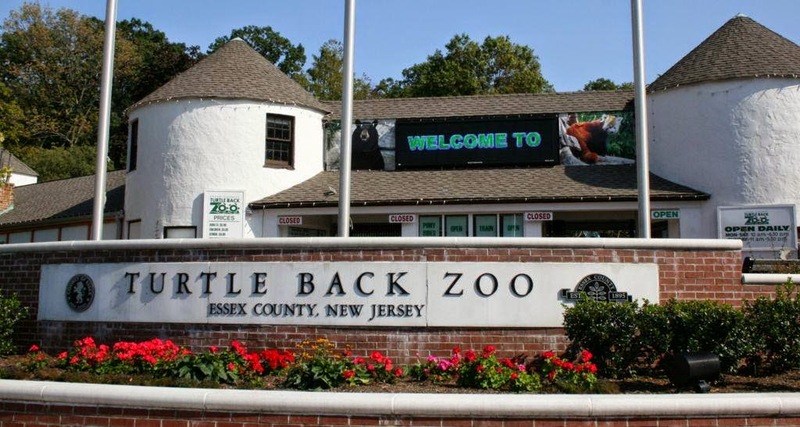 Turtle Back Zoo in West Orange, New Jersey, is a case in point. The zoo opened in 1963 with 140 animals of 40 species. Its name is derived from a rock formation near the zoo that the Lenni Lenape tribe called Turtle Back Rock. Like contemporary installations, Turtle Back then caged most of its animals. It was designed as a seasonal zoo for children and included farm animals and a miniature train ride that took visitors around the surrounding wooded area. Circa 1960s postcard of the miniature train at Turtle Back Zoo. Within a decade the animal collection had grown to 850 of 275 species. In 1975 a zoological society was established to oversee fundraising and membership. Nevertheless, by century’s end the zoo, which is now administered by the Essex County Park System, the oldest county park in the United States, was outgrowing its space and attendance was down. In the mid-1990s there was talk about closing Turtle Back. The Zoological Society launched a campaign to save the zoo. Essex County responded to pleas by children of the area to refurbish the facility. The zoo began an overhaul of its 15.5 acre site on Essex County’s South Mountain Reservation in 2000. In 2005 the 1.8 million dollar Essex County Animal Hospital was built to care for the growing population of animal residents. Between money from the county and incredible fundraising efforts on the part of the Society, animals were acquired and Turtle Back became cage less, park like and more diverse than it had been. Today one enters through an 11,000 square-foot complex that includes a gift shop, administration offices and two classrooms that can be converted into a large auditorium. This past August a new education center opened. It houses four classrooms with moveable walls to provide space for various types of programs; there is also a patio on the roof for miscellaneous events. Inside the park - and it is a beautifully landscaped park - one of the first exhibits, viewed through large windows, is a pair of black bears sniffing around in what appears to be a natural landscape of trees, logs, and a pond. Look carefully and you'll see a trim red fox napping nearby. Animals sometimes co-habit an area based on similar occurrences in the wild. A bison at Turtle Back Zoo. If you follow the winding path onward, you'll see some groundhogs going about their business, oblivious to the folks looking in on them. The wolves are next, and across the way are those bison that one usually only reads about or sees on the movie screen. Keep meandering and you’ll see a Greater Rhea, a flightless bird that hails from northeastern Brazil, Paraguay, Uruguay, and Eastern Argentina. Nearby you can view a llama or two from similar areas of South America. Did you know that llamas have been domesticated for about 4,000 years? Information posted nearby will tell you that the Inca Empire’s culture and economy revolved around this animal. A Greater Rhea at the Turtle Back Zoo. There’s also an aviary when seasonal weather permits, and one can purchase a feeding stick upon entering. Birds will actually perch close by to chew on this treat. Another up-close-and-personal exhibit is the petting zoo where pigs and baby goats want to be touched and given some of the treats that are available for them. Youngsters especially find the birds and goats awesome because they are near and touchable. For the adventurous among us there’s a weekly python feeding time at the reptile house. Don’t forget the daily sea lion meal times. And if you still don’t know the difference between a sea lion and a seal, you’ll find out at Turtle Back. Pony rides and a carousel of carved endangered animals are musts for children touring the zoo. Should you get hungry there’s a café on premises and plenty of picnic areas if you take your own snacks with you. And remember to board the train for a ride around some of the perimeter of the attraction. Carousel at the Turtle Back Zoo. Talks and presentation of various kinds are given from April through October. Educational programs are available year-round. Turtle Back offers, for a fee, the use of certain sections of the park as rentals to celebrate children’s birthdays, corporate events and adult receptions. There’s always something happening here. Spending some time at Turtle Back, whether it be a few hours or an entire day, will be a rewarding and awakening experience. Zoos are not what they used to be. This specific one is certainly driving home that point. Author Connie and her granddaughter Ella at the Turtle Back Zoo. A lifelong resident of New Jersey, Connie McNamara has lived in Mountainside since 1974. She graduated from Douglass College and earned an MA in English from Seton Hall University. She taught high school English for more than thirty years, during which time she served as advisor to the school newspaper, which won numerous awards from the Columbia Scholastic Press Association. A stint at Newsweek magazine interrupted her career in the educational arena. Later, as assistant editor at New Jersey Savvy Living, she renewed her calling to the communications field. Since then, she has been a freelance writer. Connie is the author of A History of Mountainside: It Was Only Yesterday, published in 2010 by The History Press.